If you were a spud on my plot last summer, then 2016 was not a good year for you. Due to some neglected plots next to ours, my second earlies were decimated by invading critters. Over one weekend they reduced the plants to stubs, killing most of my crop. Thankfully, I had also decided to grow some Charlotte potatoes in sacks, although one of the sacks was then invaded by red ants. Finally, to rub salt into the wounds, my lates were taken out by blight. This year will be different. This year I have a little something up my sleeve. 2017 will be the year I’ll have potatoes coming out of my ears..? 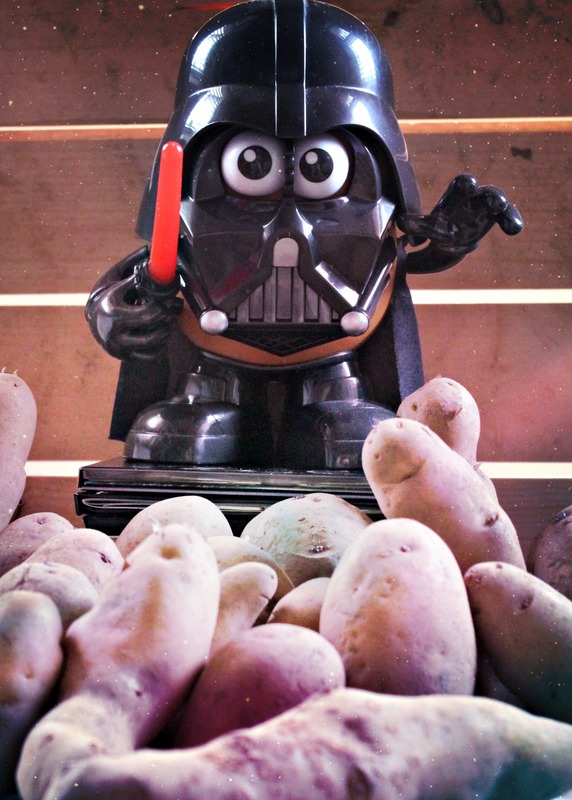 Meet Agents of Field’s latest recruit: Starch Lord, Spud Vadar. He’s about to bring order to the Empire. Taking on these seeded apprentices, he will teach them the ways of the carbohydrate, and ensure they fulfil their chitting destiny, before taking their rightful place on the plot. Chitting is strong in this one, let him go green and he will unleash his toxins. So why chit? 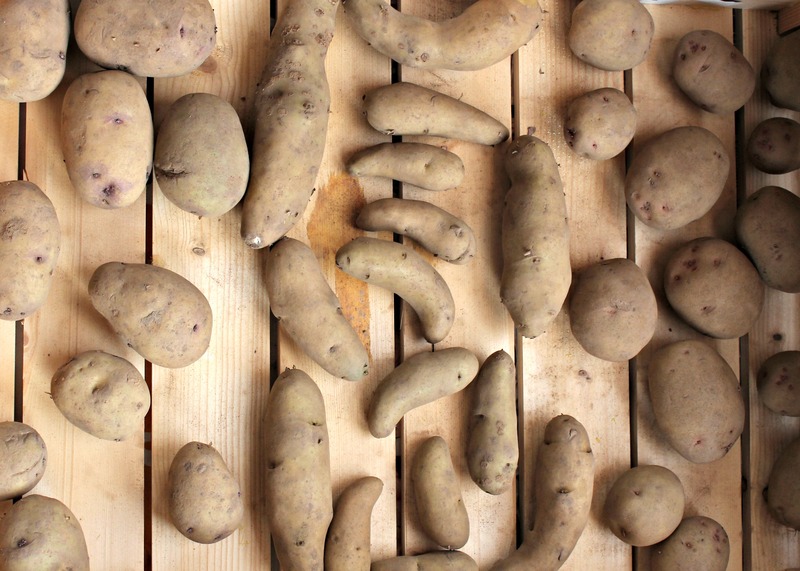 At this time of year, with Jack Frost on the loose and the ground retaining no heat, six weeks of chitting gives your future crop a head start. Some people chit, some don’t. Personally, I enjoy the ritual. With little growing at this time of year, I’m keen to take on any gardening activity that I can. It warms the body and soul for the growing season ahead. Place the seed potatoes in a well-lit, well-ventilated spot and ensure none are touching one another; an empty egg box makes a good holding pen. Then ensure the eyes are looking towards the sun. Six weeks on, you should have shoots a few cms long. On a frost-free day, plant them out. In a well-prepared, fertilised bed, I dig trenches at about 15cm deep. Adding a layer of compost at the bottom, I place the seeded potatoes with their shoots facing upwards, at intervals of 30 cms apart. Filling in the trenches, I then water the bed. After that, it’s all about keeping the bed weed-free and well-watered. If there’s still a chance of frost, I place a fleece over the area to protect the crop and stop scabbing. After that, once the plants have established, earth them up. That way, you’re forcing them to produce more tubers giving you a larger crop. I’m growing three varieties of second earlies this year; Kestrel, Cara and Ratte. Kestrel is a loyal favourite and the other two are new for me. If you find you’re lacking growing space, why not try a little successional sowing on the potato bed. This is where you sow quick-growing crops on top of the spuds, crops that will mature before your potatoes come into fruition, so you can grow them all in the same bed. This year I’m going to try it with radishes. I’m puling out all the stops for my potatoes this year and I urge you all to do the same. As Yoda would say: Do. Or do not. There is no try. May the force be with you, Ade! Just like you I will do anything to start the annual gardening rituals again. 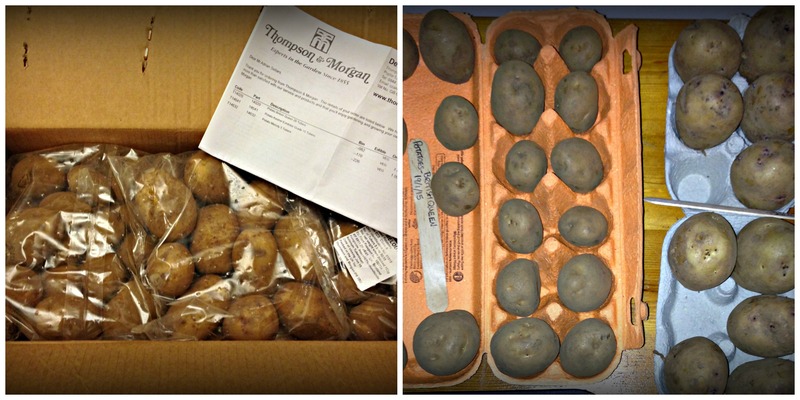 My spuds will be prepared to chit on the only empty windowsill later this week and I will try some new ones. And unlike last year I’ll carefully record what spud goes in what bed so that I know what we are eating. And may the spuds be with you!